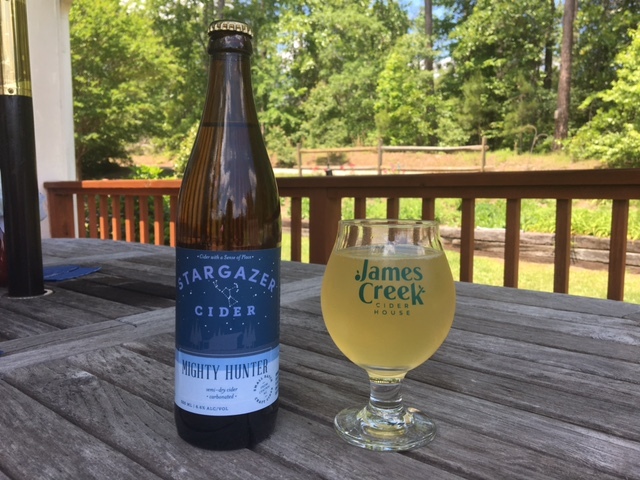 Cidermakers and orchardists Ann Marie & David Thornton from James Creek Ciderhouse in Cameron, NC join us on the roof for a tasting of their award-winning Stargazer Mighty Hunter Cider. Ann Marie and David grow apples, peaches, pears, persimmons, muscadines and blueberries on their farm in the Sandhills about an hour south of Durham and have been vendors at the Carrboro Farmers’ Market since 2014. They grow over 50 varieties of apples, mainly cider and old Southern heirloom varieties, and source apples from other family farms within 125 miles of the cider house. Stargazer Ciders are crafted in small batches from 100% locally-grown, fresh-pressed NC apples and are all naturally gluten-free.